Here we go again. We're heading into another weekend, and there's a big buzz brewing in the meteorology world about a winter storm that could have New Jersey in its sights. Problem is, the storm in question hasn't even formed yet. And different computer models are projecting different tracks and different outcomes, making it difficult for forecasters to predict whether the Garden State will get hit with snow, rain, a combination of the two, or not much of anything. "It's still a little too early to be sure, " said Kristin Kline, a meteorologist at the National Weather Service regional office in Mount Holly. 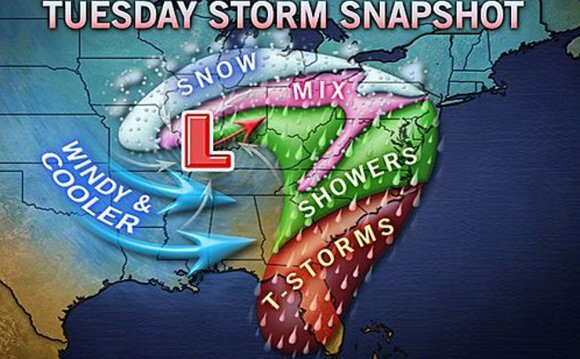 "There is a potential for a storm system to affect the area" next Tuesday into Wednesday. "There are some indications it could track out to sea and not affect the area very much, " Kline said. "But there are some model solutions showing it could affect the area. There are too many question marks at this point to say for sure what is going to happen." If it does move up the coast, the exact track would play a big role in the temperatures and the type of precipitation that falls. If the storm tracks over New Jersey or very close to the coast, warmer air from the ocean would likely flow over the state and warm things up, making it more likely we would see more rain and less snow. Under that scenario, "temperatures may be cold enough for some snow along the Interstate 95 corridor at the onset of the event, however, precipitation would likely change over to rain at some point, " said Brett Rathbun, a meteorologist for AccuWeather. That's what New Jersey ended up with on Presidents Day, when a storm system from the Tennessee Valley swept north and east, dropping several inches of snow before it mixed with sleet, changed to freezing rain, then changed to plain rain as temperatures started warming up above the freezing mark. The storm system Monday was followed by strong thunderstorms from the eastern Gulf Coast that swept through the Garden State on Tuesday, bringing winds as strong as 60 to 70 mph, toppling numerous trees and power lines, and causing widespread power outages. With so much uncertainty over next week's forecast, Kline said the best thing for Jerseyans to do is watch and wait — and be prepared to change your travel plans if the forecast looks bad. Guidance from @NWSWPC shows another winter storm threat for next week in Tue-Wed timeframe. You know the drill this far out in time. Too soon for details on amounts and precise locations. Keep an eye on the forecast. Meteorologist ' ' ' Michelle Grossman' ' ' joined NBC 10 "EarthWatch" team on January 28, 2008, Prior to joining NBC 10, Grossman worked for NBC Weather Plus in Englewood Cliffs, NJ, Where she was a Meteorologist.